Conosci Riga a piedi in questo tour privato a piedi. Passeggia per le pittoresche strade di ciottoli della città e scopri la storia di Riga da una guida. Esplora la Città Vecchia e ammira le attrazioni che includono la Chiesa di San Pietro, la Chiesa di San Giacomo, la Cattedrale di San Dom, la Torre delle Polveri, la Porta Svedese, i Tre Fratelli e altro ancora. I took a 14 day cruise through the Baltic Sea and went on all of the ship's tours except this one. 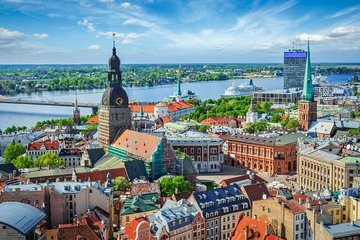 I wish I had booked more through Viator after having experienced this walking tour of Riga. The tour guide, Santa (which means Saint), was beyond fabulous. She was knowledgeable, professional, and ensured we had a memorable experience. Her English skills were better than many Americans, and her warm personality and sense of humor were very much appreciated! I highly recommend this tour with Santa! Wonderful time with gorgeous guide who took care of 4 girls in big city. It was very nice to be welcomed and treated so nicely in the city of Riga. We enjoyed privately made tour, which answered all our requirements. The guide told us a lot of interesting facts, that made us love the city. Many many many thanks! Our guide Maria was pleasant and knowledgeable. We hit all the sites expected and had plenty of time afterwards for shopping, etc.